Hurricane Irma, one of the largest hurricanes ever recorded in the Atlantic, caused significant damage to the northeastern Caribbean and is currently projected to make landfall this weekend. 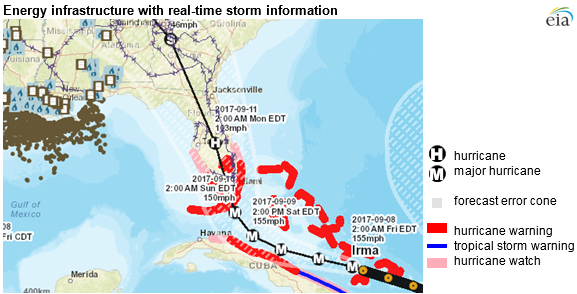 Current model forecasts project that Hurricane Irma will then pass along or just offshore the east coast of Florida, although the actual storm track could change from current projections. To help analysts assess potential energy-related storm effects, EIA maintains an energy disruptions map that displays energy infrastructure and real-time storm information. Hurricane Irma initially made landfall in the Caribbean as a Category 5 hurricane with sustained wind speeds of more than 185 miles per hour, which made it the second-largest hurricane ever recorded and tied it with the 1935 Florida Keys hurricane as the largest Atlantic hurricane to make landfall. In advance of the storm, states of emergency were declared in the U.S. Virgin Islands, Puerto Rico, and Florida. Thirty counties in Georgia are also under a state of emergency, as are the states of North Carolina and South Carolina. Significant power outages have already been reported in the U.S. Virgin Islands, with the islands of St. Thomas and St. John reporting that all customers had lost power. The Puerto Rico Electric Power Authority has reported more than one million outages. As Hurricane Irma approaches Florida, high winds, flooding, and storm surge have the potential to affect energy infrastructure such as power plants as well as power transmission and distribution lines. Utilities in the state are preparing for high levels of power outages, and officials in Florida are making plans to shut down two nuclear power plants—Turkey Point and St. Lucie—prior to the arrival of the storm. The last major hurricane—those rated Category 3 or higher—to make landfall in Florida was Hurricane Wilma in 2005. Hurricane Wilma caused widespread power outages in the state. Florida Power and Light, the largest utility in the state, reported more than three million customer outages. In 2016, Hurricane Matthew, which did not make direct landfall in the state, caused more than one million outages. EIA’s energy disruptions map displays key layers of energy infrastructure, including oil refineries, power plants, and major electric transmission lines, and real-time storm information from the National Weather Service. The web page also contains links to the U.S. Department of Energy’s Emergency Situation Reports and other websites that provide updates on the effect of severe weather on energy infrastructure. In addition, EIA's U.S. Electric System Operating Data tool provides near real-time information on electricity demand and can show areas where electricity service has been disrupted.